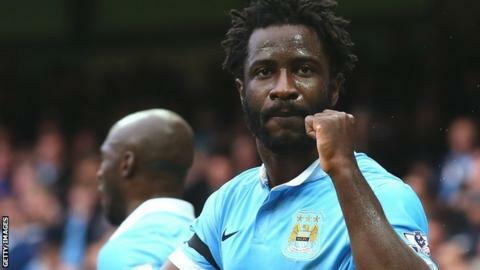 Manchester City striker Wilfried Bony has confirmed he contracted malaria during pre-season. Bony, 26, did not travel on City's summer tour of Australia and Vietnam. While the Premier League club cited illness as the reason for his absence, the Ivory Coast international has now revealed why he was unavailable. "I got malaria from Africa when I was coming back but I am okay now," said Bony after scoring twice in City's 5-1 win over Bournemouth on Saturday. "I feel I have turned the corner. I have had a lot of injuries and been sick, and feel that is all away from me now. "I just want to do my job, do my best in training and score when I get my chance in the match. Every striker is happy when he scores, especially when the team wins." Because of a combination of international commitments and injuries, Bony has struggled to make an impact at Manchester City since joining from Swansea in January for a fee of up to £28m. With Sergio Aguero injured, Bony made the most of his opportunity to start up front against Bournemouth as his brace and Raheem Sterling's hat-trick consolidated City's position at the top of the Premier League table.